Transportation to the airport just got easier. 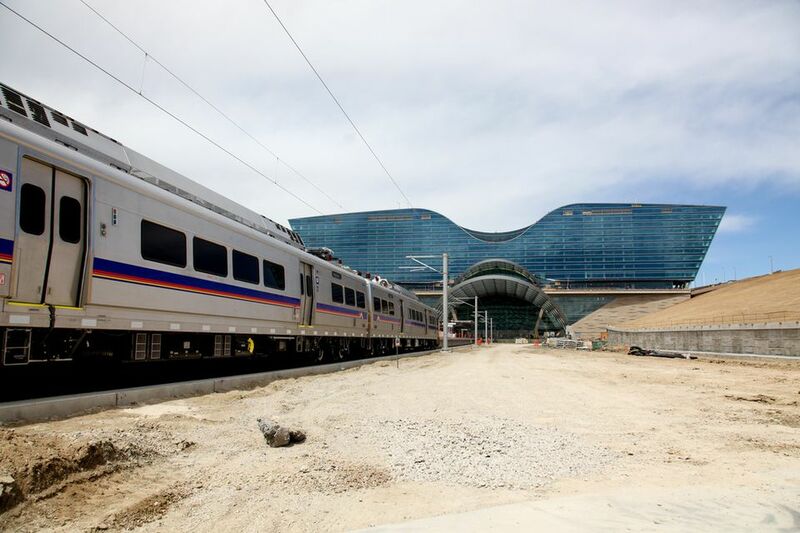 Getting to and from the Denver International Airport just got a lot easier. Although DIA has to be one of the most architecturally interesting (and beautifully artistic) airports in the world, it’s also located way east of downtown, right next to nothing and one stop past nowhere. It is far from convenient. Granted, this isolation is a blessing to residents, who don’t have airplanes flying directly above their homes, like the previous location of the airport in the now-Stapleton neighborhood. But for travelers, it’s a pain, packed with busy streets or pricey toll roads. I-70 can be a traffic nightmare and exponentially extend the commute. Add to that the hurdle of parking or renting a car, and you’d need to leave two hours before the two hours you need to arrive early for an international flight. Colorado’s long-awaited University of Colorado A Line train aims to ease all of that. This 23-mile rail system shuttles passengers from DIA directly to Union Station in the heart of downtown, in a speedy 37 minutes. It just opened a few days ago. With DIA as the country’s fifth busiest airport, with 53 million passengers annually, this affects a lot of people. For residents wondering how to best maneuver this new railway, to travelers looking for the most seamless vacation transportation possible, here’s our inside guide on how to use the new A-Line. Denver Union Station is the endpoint (and a fantastic place to stay, drink, dine and shop, by the way), but it’s not the only stop. The A-Line has a total of eight different stations along the route, making it also an option for commuters, as well as travelers along the busy I-70 corridor. Other stops include 38th and Blake, 40th and Colorado, Central Park, Peoria, Airport and 40th Boulevard, Gateway Park, 61st and Pena Boulevard and, of course, the airport. You can also connect with the rest of the RTD network via buses at Union Station. DIA is proud to claim that no other airport in the nation offers such a short distance from the plane to the train. The A-Line drops travelers off right under the new Westin Hotel, a few steps to the stairs (or preferably an escalator, as it’s said to be the state’s longest) that bring you to the security checkpoint. You can drop off your bags at the new transit center, which connects with many airlines (and more on the way). Even print your boarding pass for some airlines in one of the kiosks. Note: Travelers no longer catch the bus on level five, but instead will head to the transit center on the south side of the main terminal. The train will run every 15 minutes for most of the day (from around 4 a.m. weekdays until 1:30 a.m.) and every half hour during slower times, such as overnight. A simple $9 ticket will get you to the airport from any of the seven A Line stations, including Union Station. This fare allows for unlimited trips along the line during that day, too. Check RTD’s website for various fare structures along the line. Get tickets at vending machines on the train platform. The train cars are designed for travelers with luggage. You can also find power outlets for your technology. The various A-Line stations combined boast 4,300 parking spaces if you have a car you need to park. Until now, Colorado’s train system was a light rail. A light rail can run along crowded, narrow streets and can go 55 miles per hour, with quick starts and stops. A commuter rail usually has fewer stations, can go up to 79 miles per hour. The commuter rail can also hold more passengers (170, up from 155). The A-Line has been in development for decades. Plans began in 1997. It is funded by the Eagle P3 Project. It opened April 22, when it offered free rides for the day, so people could check it out. The trains were packed.